STRENGTH: 14 – 18/00 – Use d6 and 5 or 6 equals 18, with a percentile bonus of 25% to the roll if a 6, but 18/00 maximum. 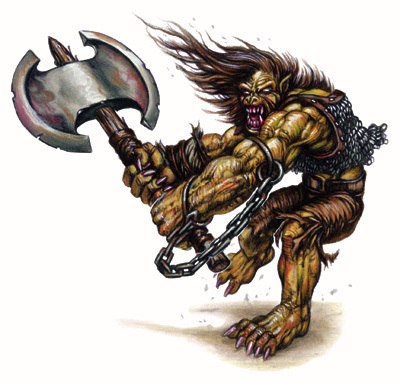 CHARISMA: 2 – 8 – Charisma score would not apply to ogres and half-ogres; double the result for the charismatic effect on such creatures. Half-orcs would rate a T, humans an N, and half-ogres a P. All others would be H both ways. Speak ogre, orc and troll only if raised with ogre parent. Complexion will be swarthy and dull, hair lank and dark. Average height will be 7-1⁄2’. Two hit dice at 1st level, then regular progression as usual. Gary notes that this would probably be a rather boring class for a PC to play, but would make a good NPC as a guard or mercenary troop. I’m not sure I agree, I think it would be fun to have such a brute as a PC (and I notice 3.5e and Pathfinder have a Half-Ogre race similar to this one). In any case, it is generic enough to be used in with any d20 old-school fantasy game, percentile strength is probably the only AD&D-ism. I loved this article back int he day. Even had an Half-Ogre character for a little while. Ah, cool! I haven’t ever played one, but I’m definitely going to at least use them as badguy NPCs. Reblogged this on the icosahedron.